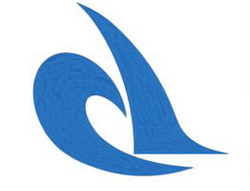 On October 1, 2003, when we solicited the public to suggest the symbol mark (school badge) of "Tokyo University of Marine Science and Technology" born as the result of the merge of Tokyo University of Mercantile Marine and Tokyo University of Fisheries, more than 1,100 candidates were suggested. We thank all the applicants from our hearts. After the strict selection from the view point of the suitability for the new university, we selected the best one and 3 runner-ups and decided to adopt the best one as the symbol mark (school badge). The best work (Mr. Takeo Okada, Tokyo)The design symbolizes the young power about to set sail for a big ocean against a backdrop of a big wave. Also, it visualizes marine research and passion path with the mast and the fish fin, suggesting strength and sturdiness. The selection reason: The magnificent ocean is represented well. Also, it seems two waves are communicating, which seems to mean 2 universities are merged. We selected this dynamic mark as the best mark suitable for the new university.